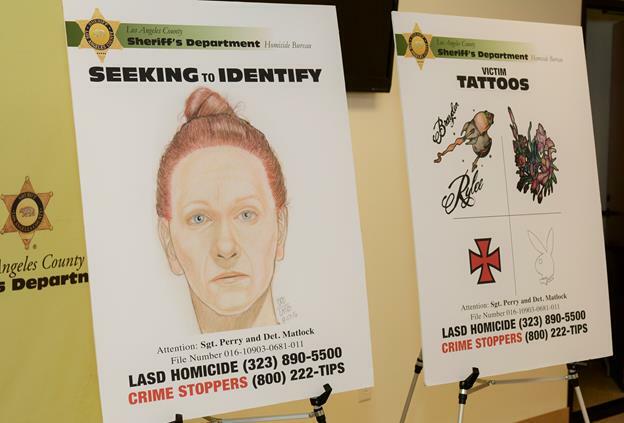 At a press conference Aug. 18, authorities released drawings of the face and tattoos of a woman whose body was found Aug. 14 near state Route 138 in the unincorporated Gorman area in hopes of identifying her. She was later identified as Kimberly Harvill, according to the sheriff’s department. GORMAN – The woman found dead last week in some brush near state Route 138 has been identified, sheriff’s officials said. 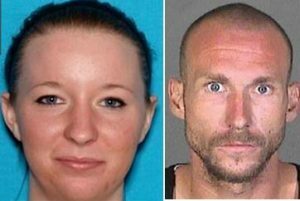 Authorities are now asking for the public’s help in locating two suspects wanted for questioning in connection with the woman’s death and for the kidnapping of her three young children. Around 5 p.m., Sunday, Aug. 14, the woman’s body was spotted by a motorist traveling along Gorman Post Road, north of State Route 138, the Los Angeles County Sheriff’s Department reported. She apparently had suffered “head trauma,” authorities said. Authorities held a news conference last week to ask the public to help identify the woman, and she was later identified as Kimberly Harvill, according to the sheriff’s department. Harvill’s sister, 22-year-old Brittany Humphrey, and her friend, 27-year-old Joshua Robertson, are wanted for questioning in Harvill’s death. 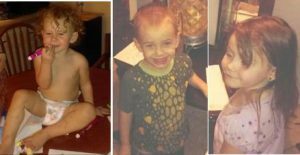 And a warrant has been issued for their arrest for the kidnapping of Harvill’s three young children. View the wanted poster here. At a news conference Wednesday morning, sheriff’s homicide Lt. Joe Mendoza said the identification of the victim led detectives to conduct interviews in Fresno — where Harvill lived — and in Lebec. Detectives formed the opinion that Harvill’s sister, 22-year-old Brittany Humphrey, and her friend, 27-year-old Joshua Robertson were involved, Mendoza said. Harvill’s children — Joslynn Watkins, 2; Brayden Watkins, 3; and Rylee Watkins, 5. View the Missing Persons bulletin here..
“We believe that the sister, Brittany Humphrey, and (her) acquaintance Joshua Robertson were with them, and we believe that they took the children some time either before the murder or after the murder,” Mendoza said. Detectives believe the suspects fled with the children toward Arizona or New Mexico, Mendoza said. The suspects may also have family in Nebraska, and have some ties to Kansas, Louisiana and Mississippi, Mendoza said. The pair is wanted for kidnapping Harvill’s children — Joslynn Watkins, 2; Brayden Watkins, 3; and Rylee Watkins, 5 — and a warrant has been issued for their arrest, according to authorities. Robertson and Humphrey are also wanted for questioning in Harvill’s death, detectives said. Investigators have yet to disclose a motive. Robertson and Humphrey are believed to be traveling with the children in Harvill’s green 1999 Ford Expedition, which may bear California license plate number 7BEK024, or paper plates, authorities said. The children have been listed in law enforcement databases as missing persons at risk. Robertson has a criminal history, is on post-release community supervision, and has a previous arrest for possession of a firearm, authorities said. He should be considered armed and dangerous and the public is advised to not approach the suspects if they are spotted but to notify law enforcement. Anyone with information about the case is asked to contact the Sheriff’s Homicide Bureau at 323-890-5500. To provide information anonymously, call Crime Stoppers at 800-222-TIPS (8477) or access the website http://lacrimestoppers.org. UPDATE: The three missing children were found safe in a motel on the outskirts of Albuquerque, New Mexico, according to an update by the Sheriff’s Information Bureau. The suspects left the children in the care of a Good Samaritan who in turn notified local law enforcement. The two suspects are still on the run. Read the sheriff’s update at: http://local.nixle.com/alert/5710470/. 10 comments for "Body ID’d, two suspects wanted for questioning [updated]"
Why are the Detectives names, Mattlock and Perry sound like they used fake names. If the children were left with a good Samaritan in New Mexico, why does the good Samaritan not come forward? Why are they still on the run? Lastly, where is the father of these children? How can you kill your own sister and then take her kids? Evil is all I can think of. Those poor kids are probably so confused. I’m sure they ask for their mother. I read the father committed suicide awhile back. The Samaritan did come forward, that is how we know about where the kids are. Running from the murder/accidental death during an argument (that second part is just a thought on the why). Going with my thought there, taking the kids was just a reaction without thought in the heat of the moment. A person will not normally abandon a child on the edge of the road. I think when they heard they were being sought for kidnapping as well they decided to lessen charges and get the kids back to where they belong after the adrenaline rush. It is very sad all around. I know the entire family personally and I know that there is no way in hell Brittany killed Kim. They were not just sisters but best friends as well. I just hope they find the person responsible for my dear friends murder. Rex is more concerned that his pal Frank gets an EZ $10 mill for a useless LEAOS plan than he is about doing something meaningful to lower crime. While he continues to fund LEAPS, and blame the homeless and single serve alcohol, crime continues to rise in Lancaster and fall in Palmdale. Praying the children are found safe & sound. If the sister is involved in the murder of her own sister I can only imagine the danger & risk these children face. Very sad & tragic. They were left with a good Samaritan in New Mexico. They are still on the run.